Rice & Rose associate attorney, Jackie Roys, pictured here on the left with Melissa Murphy, Esquire, was featured on the front page of the June 15, 2012 issue of the Florida Bar News. 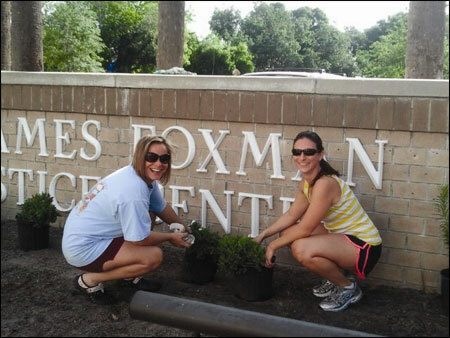 The Volusia Flagler Association for Women Lawyers, in conjunction with the Teen Court program in Volusia County, volunteered to landscape the area surrounding the Foxman Justice Center sign in Daytona Beach, Florida. VFAWL donated the landscaping and its members to install the landscaping. Teens from Teen Court earned their required community service hours by helping. Ms. Roys is the current president of VFAWL and Ms. Murphy is the immediate past president. The Florida Bar News is published twice monthly by the Florida Bar and goes to all Bar members. To view the article, click here.